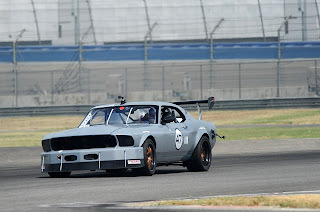 According to our sources at Ford Racing, production of the 2013 Mustang Boss 302S is now underway at the Flat Rock Assembly Plant with deliveries scheduled in time for next year’s race season. Just fifty are scheduled to be built – the same as 2012, with pricing listed at $85,000. Colors for the turn-key race car are limited to Performance White and School Bus Yellow. The most obvious changes for the 2013 model year are the exterior design and graphics, which coincide with the updates to the road-going Mustang Boss 302 – a new front and rear fascia, LED taillights and 1970s-style stripes. The vented hood from the 2013 Mustang is now used as well, replacing the Tiger Racing vented hood used in 2012. The only other change is the availability of optional Dynamic Suspension DSSV 3-way adjustable front and rear shocks. With the 2013 Boss 302S Ford Racing hopes that the Mustang Boss 302S continues its success from the past couple years, which includes a 2011 World Challenge GTS Manufacturers Championship, 2011 World Challenge GTS Driver Championship, 2011 World Challenge GTS Team Championship, 2012 NASA American Iron Championship, and 2012 NASA ST2 Championship. This entry was written by by MustangsDaily (Mustangs Daily) and posted here on Thursday, December 6th, 2012 at 2:11 pm and is filed under 2013 boss 302s, 2013 ford mustang boss 302s, boss 302s, ford mustang boss 302s, Motorsports, mustang boss 302s, News. This article was not written by us, rather gathered using RSS feeds listed here. We take no credit for this article. You can leave a response, or trackback from your own site.